It’s not a Bird or a Plane – It’s a Mars Rover! In addition to the Mars rover, the free Summer of Mars Experience will include interactive games that allow consumers to learn about plant life and habitats on Mars, virtual reality which will transport visitors to the Red Planet, periodic pump rocket launches, photo opportunities, premium giveaways and more. July 14-17, 2017 The Battery Atlanta at Sun Trust Park, Atlanta, Ga.
July 21-23, 2017 National Air & Space Museum, Washington, D.C.
July 29-30, 2017 Liberty Science Center, Jersey City, N.J.
August 2-6, 2017 Intrepid Sea, Air & Space Museum, New York, N.Y.
August 12, 2017 North Point Mall, Alpharetta, Ga. Built by Cape Canaveral-based Parker Brothers Concepts, with input from NASA-engineer science and specifications, the Mars rover seats four passengers and was built to handle the climate, conditions and environment on the Red Planet as they are currently understood. It is a dual-purpose vehicle that can be used as either a small scout vehicle or a full research laboratory and features carbon fiber accents, solar panels and 50-inch wheels that are specifically designed to let the fine sands of Mars slip through. 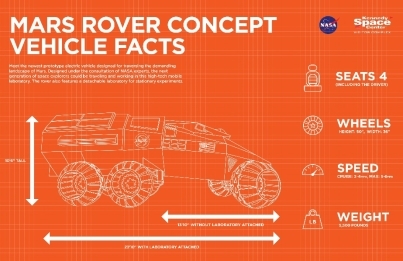 It is powered by a 700-volt battery and is meant to travel over dunes, rocks, craters and hills at 2 – 5mph. The Mars rover was created to be as realistic as possible for educational purposes, but won’t be making the trip to Mars. The focus on Mars as the next space destination is incorporated as a theme throughout Kennedy Space Center Visitor Complex. Mars-themed activities include the Journey To Mars: Explorers Wanted live theater and interactive experience; the Journey to Space 3D film in the IMAX® Theater; a special edition of Science on a Sphere – Red and Blue – about the Red Planet, a custom 3D Eyes on the Red Planet presentation highlighting the last two decades of our robotic exploration on Mars; and Cosmic Quest, an interactive game that includes missions to Mars like building a Mars habitat. The culmination of the Summer of Mars campaign will be the opening of the new Astronaut Training Experience (ATX) center. Scheduled to open in fall 2017, it will offer an experience unlike anywhere else, and, along with the companion program Mars Base 1, will bring guests as close to training, living and working on the Red Planet as possible without leaving Earth. In the ATX center, groups and individuals will experience training like a real astronaut using virtual reality and simulators. Training activities include landing on Mars, walking on its surface, driving on the rough terrain and experiencing microgravity. Or they can spend the day working on Mars as a rookie astronaut on Mars Base 1. Guests will be transported to the Red Planet, dock with Mars Base 1 and work in the Plant Lab, operate robotics and solve engineering challenges – just like the astronauts who will one day travel to Mars. Technology such as floor-to-ceiling 4K screens will create a realistic experience and participants will feel as though they’re actually being transported to Mars. Each guest will receive a summary of activities including STEM subjects utilized and suggested future careers related to the day’s accomplishments. Kennedy Space Center Visitor Complex brings to life the epic story of the U.S. space program, offering a full day or more of fun, inspiration and educational activities, including its newest attraction, Heroes & Legends, featuring the U.S. Astronaut Hall of Fame®, presented by Boeing, which opened November 11, 2016. Other highlights include the Kennedy Space Center Tour featuring the Apollo/Saturn V Center with an actual Saturn V moon rocket, Space Shuttle Atlantis®, Shuttle Launch Experience®, IMAX® A Beautiful Planet 3D and Journey To Space 3D films, Astronaut Encounter, Journey To Mars: Explorers Wanted, Science on a Sphere®, Rocket Garden, Cosmic Quest, and many other exhibits. Only 45 minutes from Orlando, Fla., Kennedy Space Center Visitor Complex opens daily at 9 a.m. with closing times varying by season. Admission is $50 + tax for adults and $40 + tax for children ages 3 – 11. Kennedy Space Center Visitor Complex offers annual passes starting at $75 + tax for adults and $60 + tax for children ages 3 – 11. For more information, call 877-313-2610 or visit www.KennedySpaceCenter.com.